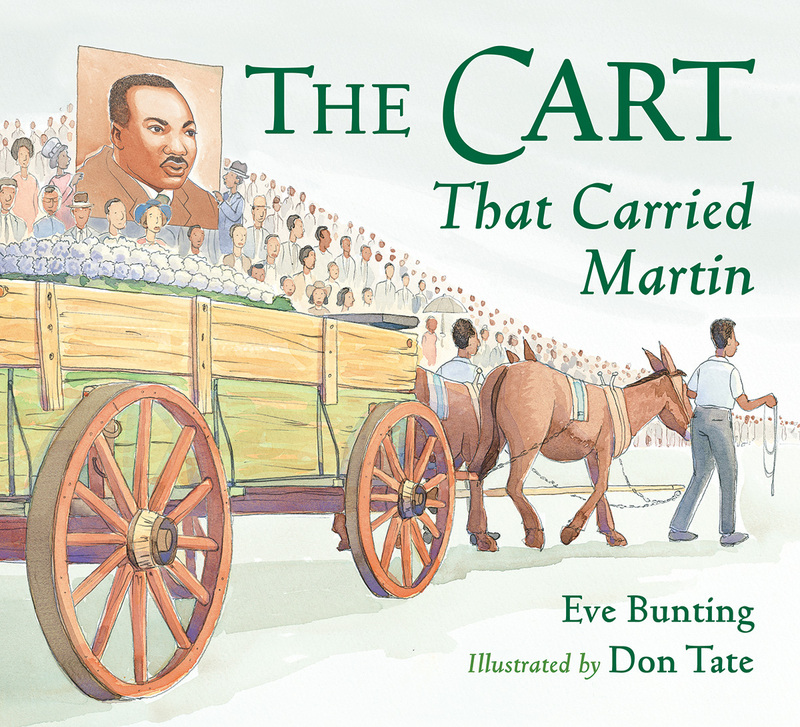 Eve Bunting’s latest work has my passion for animals, culture, history, artifacts, and social justice all wrapped up into one children’s book that addresses a brief, albeit important moment in our nation’s collective memory: the funeral procession of Martin Luther King Jr. 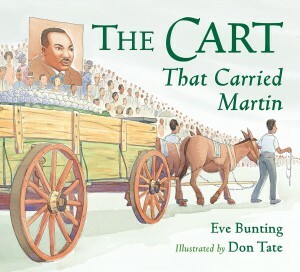 The Cart that Carried Martin doesn’t focus on Dr. King’s civil rights efforts, but on the mourning rituals that were carried out to honor his life and legacy. A simple wooden cart was discovered outside an antique shop, painted green, and selected to transport Martin from the church, through the streets of Atlanta, Georgia and finally to Morehouse College. This is how museum-housed artifacts are made. Simple, everyday objects that had a front row seat to historic events. Isn’t it interesting that mules are considered symbols of freedom, but are domesticated and used for labor purposes themselves? The mules take readers through the crowded streets and church scenes, where it becomes clear that this man is not gone. His great spirit lives on. In our hearts. In our memories. In our values. The beautiful art of Don Tate matches Bunting’s eloquent prose and truly brings this momentous occasion and King’s legacy to light. The cart can now be seen at the Martin Luther King Jr. National Historic Site. Dr. King’s love for animals continues with his widow, Coretta Scott King, who follows a vegan lifestyle. I love every book written by Eve Bunting and every book illustrated by Don Tate. Together these two talented people have created a beautiful tribute for a historic moment in time. Well-done! !